YouTube recently started a limited rollout of the Picture-in-Picture mode on its app for non-YouTube Red subscribers, and also began testing a mini-player on the web which allowed users to read comments while continuing the video playback in a small window at the top of the screen. YouTube has now begun rolling out a new format of ‘minimized video playback’, which shrinks the video into a small playback bar at the bottom of the screen. Earlier, when you tapped the back button while watching a video or dragged it down in the YouTube app, the video would shrink into a small window which positioned itself on the right side of the screen’s bottom half. But thanks to the new UI trick, the video will now collapse into a mini-player bar in which the video will continue to play in a tiny window, flanked by two control buttons- one for pause and the other one to close the mini-player bar. Moreover, the mini-player bar also shows the title of the video as well as the channel’s name, which was not the case in its previous iteration. To resume the playback in a normal-sized window, just tap on the mini-player bar or pull it upwards. If you want to close it, drag the mini-player video playback bar downwards, or tap on the ‘x’ button. However, swiping right or left to close it doesn’t work. 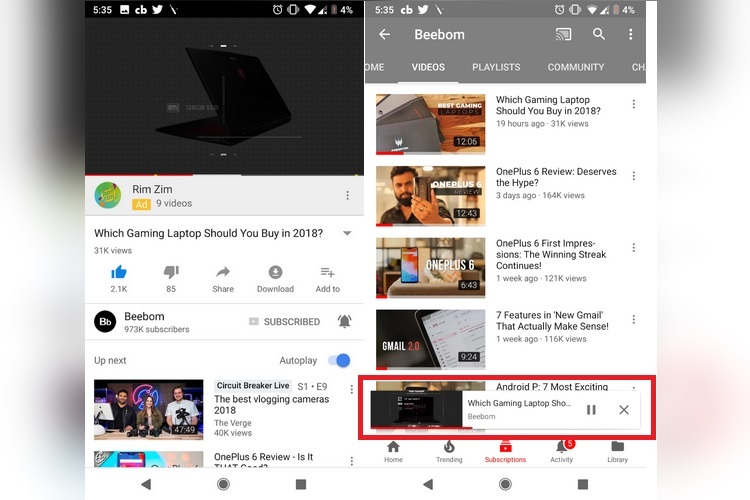 It seems YouTube is experimenting with the new collapsible video playback format to provide a richer experience with minimized videos, so that users can search for other videos without much hindrance. And removing the swipe to close functionality will prevent you from shutting videos mistakenly.